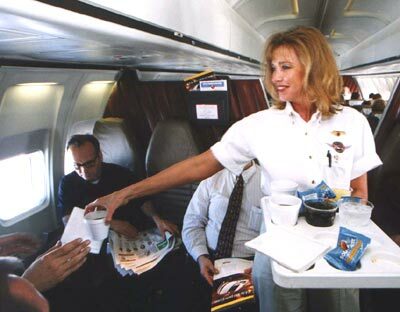 Flight attendants are an important part of the airline industry. Besides tending to the needs of each passenger, flight attendants play key roles in passenger safety and maintenance of airline regulations. Becoming a flight attendant can be a rewarding career financially and may come with other travel benefits for you and your immediate family. Meet the requirements. Most airlines will not hire flight attendants under the age of 21; However, a few smaller airlines may accept flight attendants as young as 18. You must also meet certain height requirements. On average you must be taller than 5'3" and shorter than 6'3". There are no weight requirements, although you will be expected to be physically fit enough to handle the requirements of the job. Perfect vision is not necessary as long as you wear the appropriate contact lenses. Most airlines prefer contacts over glasses. For United States based airlines, you must also be a United States Citizen. Fit the educational requirements. Most airlines require only a high school diploma for consideration of employment. Many flight attendant training programs are available, but most airlines these do not give any additional weight to your application. Flight attendant training will be provided upon an offer of employment. Fit the personal qualities that an airline looks for. As a flight attendant, you are the face and image of the airline. Besides being clean cut and professional, you should also be kind, friendly, courteous and have superior customer service skills. Working well under pressure and in stressful situations is also a positive quality to have when working as an airline flight attendant. Fill out an application. Most flight attendant applications can be found online at the specific airline's website. You can also request a paper application by calling the airline's human resources department. Have a successful interview. Depending on which airlines call you back, you will need to travel to their hiring offices for an in-person interview (airfare will not be provided for you). Some airlines do a mixture of group interviews and personal interviews, while others will rely solely on a personal interview. Dress like you want the job. A man should wear a pressed shirt, dress slacks, dress shoes and tie. A woman should wear a modest dress or business suit and should pay close attention to makeup. (Many airlines require their flight attendants to wear makeup while on duty). Go through training. Once an airline has decided to hire you on a trial basis, you will need to go through a lengthy training course. This can range from a week to several weeks, depending on the airline. Here you will learn FAA regulations, safety procedures, customer service techniques, and everything else that is needed to perform the job. After your training course, you will also go through a period of hands-on training while in flight. Pass a background check. A comprehensive 10 year background check must be passed before you can officially be hired. Felonies will almost always disqualify you from being hired as a flight attendant. Pass a medical evaluation and drug screening. You must be physically fit and drug free to be offered a flight attendant job.